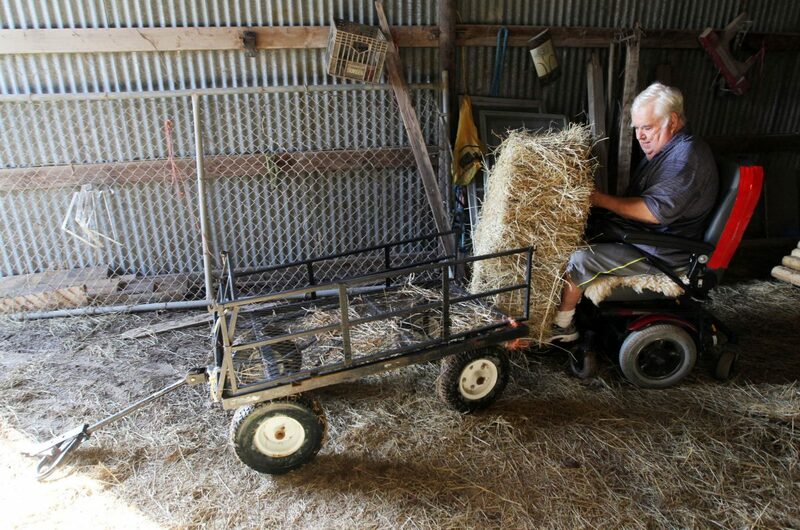 Jose Alfredo Cavazos, 69, lifts a hay bale onto the cart early Friday, Oct. 5, 2018, in Mission. Cavazos' daily routine is to feed his cattle and goats near the river. He fears a border wall will keep him from tending to his land. 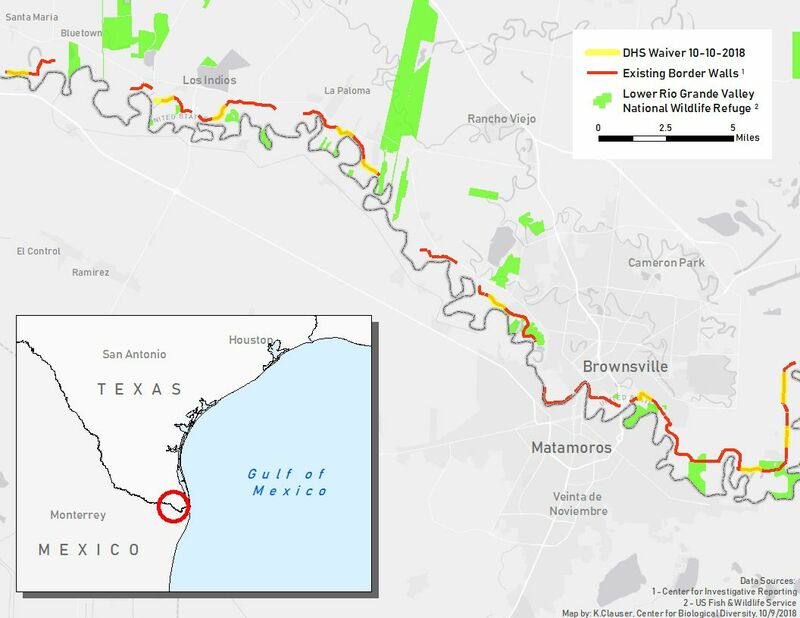 Conservation groups filed a lawsuit Thursday in response to waivers issued by the U.S. Department of Homeland Security to expedite the construction of walls in the Rio Grande Valley, court records show. 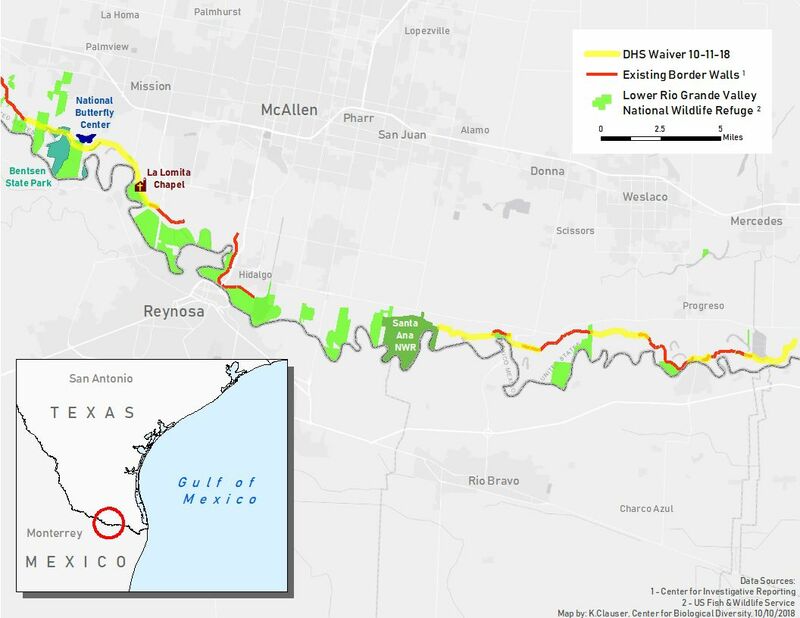 The lawsuit, filed Thursday in Washington, comes on the heels of DHS Secretary Kirstjen Nielsen filing environmental waivers intended to expedite wall and road construction in Cameron and Hidalgo counties on Oct. 10 and Oct. 11. In its filing, representatives from multiple conservation groups, including the Center for Biological Diversity, Defenders of Wildlife and the Animal Legal Defense Fund, challenge Nielsen’s issuance of the waivers filed last week. They argue in part that when Nielsen invoked the authority to waive such waivers using “Section 102 of the Illegal Immigration Reform and Immigration Responsibility Act of 1996,” she exceeded the limited grant of authority for environmental waivers, like those issued last week. Hidalgo County Map courtesy of Center for Biological Diversity, based in Tucson, Arizona. Cameron County map courtesy of Center for Biological Diversity, based in Tucson, Arizona. “Moreover, any interpretation of Section 102 that would sanction the issuance of the Lower Rio Grande Valley Border Wall Waivers would render this statutory provision so broad and unbounded in scope that it would run afoul of constitutional principles, including the Take Care Clause, the Separation of Powers Doctrine, the Non-Delegation Doctrine, and the Presentment Clause,” the lawsuit states. The issuance of waivers for last week by Nielsen confirmed what many had known for months locally, that construction would cut through places like the Lower Rio Grande Valley National Wildlife Refuge, the National Butterfly Center in Mission, Bentsen-Rio Grande Valley State Park, and the historic La Lomita Chapel, a more than 150-year old shrine behind the levee in Mission. Su and the conservation groups argue that Nielsen and DHS do not have authority to waive the Endangered Species Act, National Environmental Policy Act or other laws that protect clean air, clean water, public lands and wildlife in the borderlands. According to the lawsuit, the waiver authority, granted in 2006, expired years ago and is an unconstitutional delegation of power to the department. The waiver authority applied to border-wall construction under the 2006 Secure Fence Act, which required the agency to build hundreds of miles of border barriers. That mandate was met several years ago, with the department using REAL ID authority five times to waive more than 35 laws on 625 miles of border-wall and barrier construction. The issuance of waivers by Nielsen, which would speed up construction of 18 miles of 30-foot-high, levee-style border walls in Hidalgo County, as well as gates and other border wall infrastructure in Cameron County, comes during an open comment period that was intended to allow for opponents of the construction to give reasons why the construction should not move forward. The open comment period is expected to run into early November. Conservationists and others are concerned about the damage the construction could cause in environmentally sensitive areas. They argue that the levee-style walls planned for construction will block the natural migration of wildlife and cause dangerous flooding. “Existing walls have been implicated in the deaths of hundreds of Texas tortoises and other animals due to flooding, which is common in the Rio Grande Valley,” a news release from the groups states. The waivers filed by Nielsen will also allow bulldozing of a 150-foot “enforcement zone” south of the wall and installation of surveillance equipment, lighting and other infrastructure. Dozens of rare wildlife species, including the ocelot, jaguarundi and aplomado falcon, make their homes in this region of Texas, as do hundreds of species of migratory birds and butterflies. The area is also within historic jaguar habitat. Earlier this week, Rep. Filemon Vela, D-Brownsville, referred to the issuance of the waivers as “shameful.” Vela has long been an opponent of any wall structures being built on the U.S.-Mexico border, specifically those areas considered environmentally sensitive like the Santa Ana Wildlife Refuge, which is currently spared from construction. Vela has said that Trump’s wall would be costly, ineffective and inhumane. “Last week’s waivers show us that the administration is happy to seize family farms, bulldoze wildlife refuge tracts, and throw our communities under the bus — so long as it will bring the president’s racist campaign promise closer to reality,” the congressman said. Construction on these projects is expected to begin early next spring.